All year long, I have been working on finding the perfect t-shirt pattern. I find it very difficult to find a long sleeve t-shirt with the sleeves long enough. So I am trying out different patterns, until I find the one I want to make in multiples. This pattern is the Union St. Tee (available at Indiesew), this one has a front piece with the FBA included. All you do is place this one on top of the front pattern piece to get the FBA. I went with a Medium and the FBA piece. Now on this rib knit fabric (also IndieSew but sold out), I could of passed on the FBA piece, as this fabric has lots of stretch. You can see the extra fabric under the arm but I am okay with that. I love this fabric and it is so comfy. 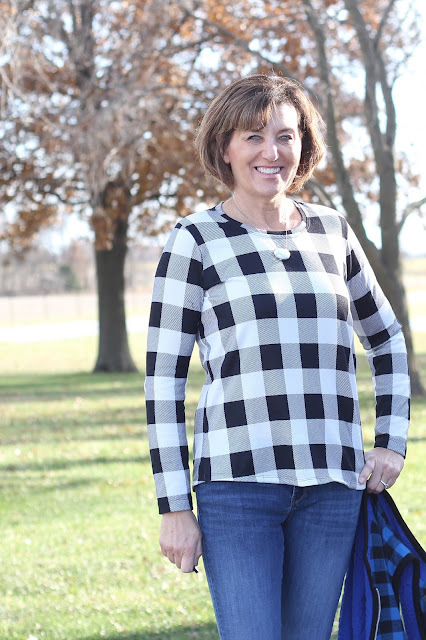 The scoop neck is the best on this pattern, I always like a scoop neck and how it looks on me. I wore it on Sunday with my Evergreen Jacket and it was a fun look. I made another one, in a grey also, grey rayon knit (sold out again, sorry) and like this one, too. I feel like this really shows how fabric changes a garment. This rayon just really shows all the wrinkles and lines. I have some navy rayon jersey and might try a few pattern adjustments. Maybe smaller at the waist and hips for a slimmer fit. 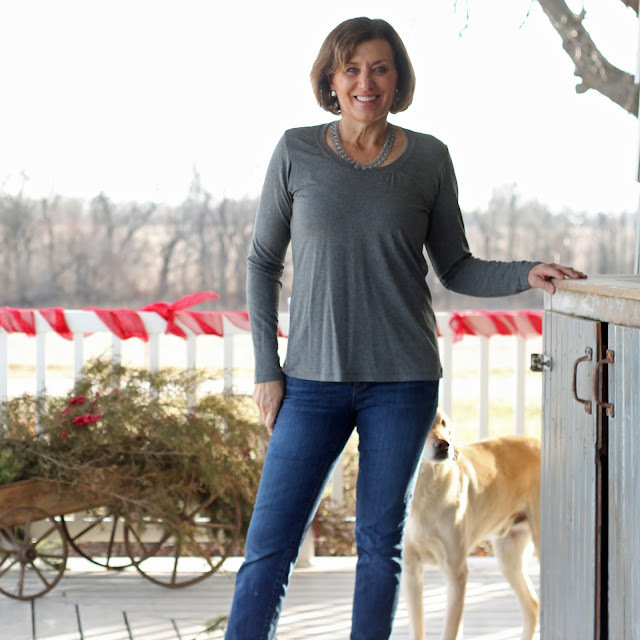 This one a knit from Joann's with little stretch, made to go with my Simplicity 1499 vest. I have always had a larger bicep - packing kids, working on the farm and now yoga. My yoga instructor loves planks, good for the arms for sure but I need extra width in patterns occasionally. I measure the sleeve width and knew I need to add a full bicep adjustment. In this large check shirt, I felt like my arms were in a sausage casing and looked like it too. Some due to the limited fabric stretch but some due to the shape of the sleeves. After looking at the pattern piece, I thought for my arm. the sleeve curves in too much at the bicep. 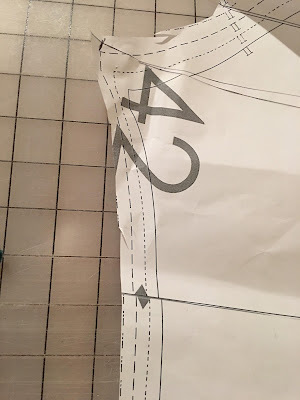 I traced this pattern onto paper and drew more of a straight line from the armhole to the hem. It looks much better to me and fits so much better. I sent this check shirt to Meredith and it looks so cute on her. The week between Christmas and New Year's, is an off week for me, I only have to work one day. 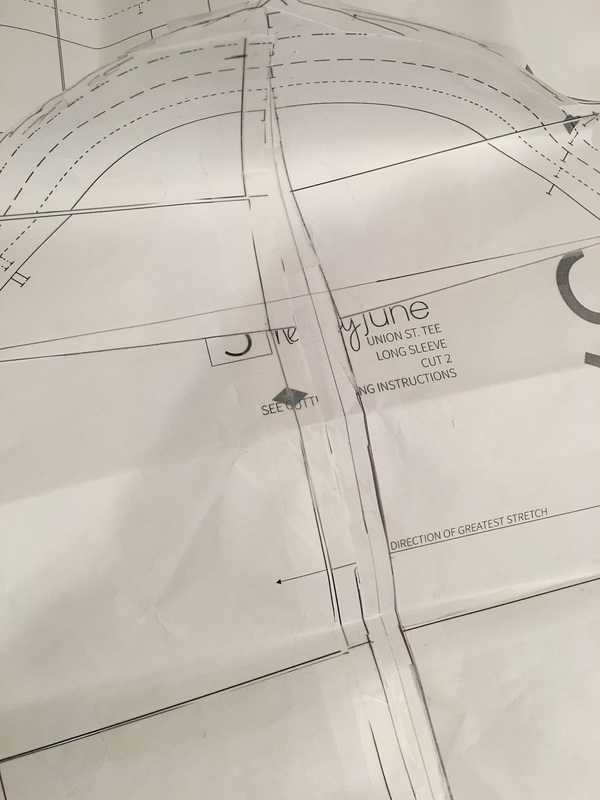 So I am going to evaluate all the shirts I have made and take the best parts of each and make my favorite t-shirt pattern. I see the body of the Briar, neckline of the Union St. Tee, sleeves - will have to see. Then find the one with the perfect length. What about you - favorite t-shirt pattern? Your shirts look great. I do like the neckline on this tshirt. I've been making Vogue 9057 lately. I think I'll give this one a try soon. Nothing like a great tee as I often say. Love your Union Street tee, it's in my collection and I really need to give it a try. 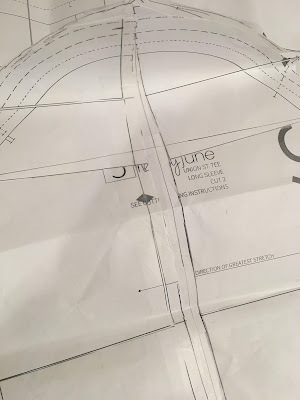 The different amounts of stretch in knit fabrics certainly don't make it easy to get the "perfect fit" in any one pattern. Have you tried the Pamela's Patterns t-shirt? That one seems to have become my go-to pattern, though it still seems to need tweaks with every fabric. Me too! Pamela's Perfect T is a great fit. it comes with a FBA, 3 different sleeves and 3 different necklines. You can also buy an add on to get more options. I have made it at least 6 times in different fabrics and no one believes its the same pattern. Love your cute T especially with your Evergreen jacket. I have a favorite T (or knit top pattern) which I self-drafted. I think you are on the right track on taking the best of the different T-shirts and making your own pattern.